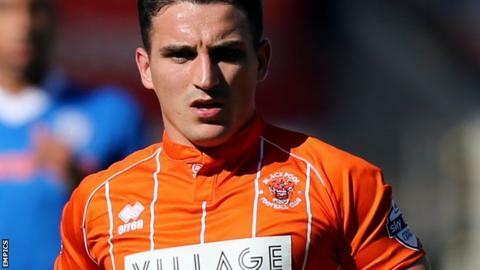 Jack Redshaw's equaliser against Barnsley was not enough to prevent Blackpool slipping back to the bottom of the League One table. Conor Hourihane's scuffed shot found the bottom corner for the Tykes following good work from Marley Watkins in the build up. Henry Cameron shot wide soon after as Blackpool looked for a quick response. Brad Potts put Redshaw free to level, while Lloyd Jones and Hourihane had chances to win it for both sides. Crewe Alexandra's win over Shrewsbury was enough to lift them above Blackpool on goal difference. Match ends, Blackpool 1, Barnsley 1. Second Half ends, Blackpool 1, Barnsley 1. Substitution, Barnsley. Simeon Jackson replaces Ben Pearson. Alfie Mawson (Barnsley) wins a free kick in the attacking half. Attempt saved. Josh Scowen (Barnsley) right footed shot from outside the box is saved in the centre of the goal. Corner, Blackpool. Conceded by Nick Townsend. Attempt saved. Jack Redshaw (Blackpool) left footed shot from outside the box is saved in the bottom left corner. Attempt missed. Conor Hourihane (Barnsley) left footed shot from outside the box is close, but misses the top left corner. Kadeem Harris (Barnsley) is shown the yellow card for a bad foul. Attempt saved. Conor Hourihane (Barnsley) right footed shot from outside the box is saved in the bottom left corner. Substitution, Blackpool. David Norris replaces John Herron. Attempt missed. Michael Smith (Barnsley) header from the centre of the box is close, but misses to the right. Substitution, Barnsley. Michael Smith replaces Sam Winnall. Corner, Blackpool. Conceded by Josh Scowen. Corner, Barnsley. Conceded by Lloyd Jones. Attempt missed. Kadeem Harris (Barnsley) left footed shot from the left side of the box is just a bit too high. Attempt missed. Brad Potts (Blackpool) right footed shot from outside the box is close, but misses to the left.